Although the planet earth seems to be a solid, it is actually much more of a liquid. The very core of the earth is believed to be comprised of solid iron, measuring some 780 miles from the center to its edge. The next 3,000 miles out is all liquid. The first 1,380 miles is liquid iron and nickel, while the remaining 1,550 to 1,750 miles (it varies in different locations) is a mixture of molten and solid rocks known as the mantel. The outermost 5 to 40 miles is the solid crust which we stand on and feel so secure about. In fact, the molten iron ore and rock beneath us is in constant motion, churning upwards in the same way the bubbles boil from the bottom of a boiling pot of water. This churning motion causes the hard crust to crack and shake (earthquakes). The mantel material pushes its way to the surface through volcanoes and undersea oceanic rift zones. The lightest material in the earth's crust has gradually come together to form the continents, which literally float on top of the heavier crustal material. The churning molten rock below pushes the continents around in a process known as the theory of continental drift. In addition to the continents, large blocks of heavier ocean floor are also being pushed about the surface of the earth. The study of this process is known as "plate tectonics." 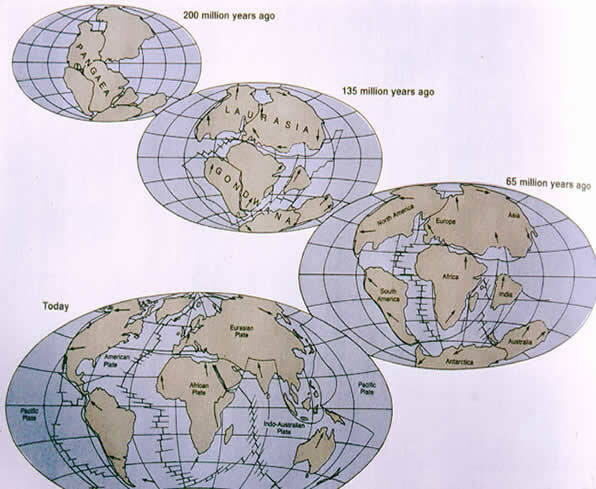 Some 20 ocean and continent plates have been identified on the surface of the earth today. Facts about the Planet Earth* - Also includes a lot of earth images. Lower Precambrian Era = started 3,800 m.y.B.P. Upper Precambrian Era = started 2,500 m.y.B.P. Paleozoic Era - Cambrian and Ordovician Periods = started 570 and 500 m.y.B.P. Silurian and Devonian Periods = started 430 and 395 m.y.B.P. Permian Period = started 285 m.y.B.P. Cretaceous Period = started 135 m.y.B.P. Pleistocene Epoch = started 1.7 m.y.B.P.